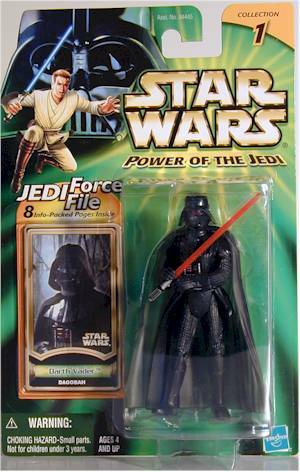 Another new figure in the latest assortments is Darth Vader from the planet Dagobah. However, as everyone will recall, the vision that Luke had of Vader on Dagobah was actually himself. This figure is part of the latest wave of Collection 1 currently hitting Walmart, Target and Meijers predominately. At about seven bucks most places, we're still getting ripped off. Nothing new to say - decent packaging but nothing special. There is one important point with this figure though - if you don't open one up, you'll never get the real enjoyment from this particular version. On the card he looks like just another Vader, but he's so much more this time. Remove the face plate and voila! It's Luke! The headsculpt is fairly decent, and the overall body is well done. 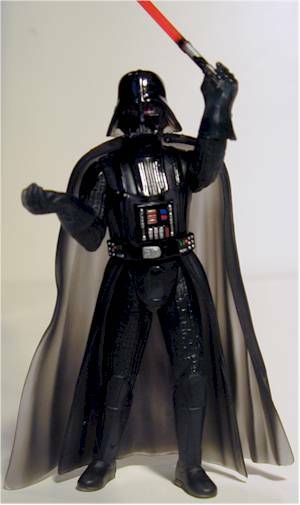 Another nice feature of this version is that the entire body is done in translucent black plastic, giving him that ghostly look from the Dagobah sequence. Oh my God, they've articulated a figure! Rather than being stuck with the usual 5 points or less, this time Hasbro went all out. Neck articulation (and the head is removable), shoulder, elbow, forearm, waist, and hips give him a whopping ten points. The only thing missing is the knees, but considering the decent pose they've sculpted, it's not too much of a problem. He stands well, and with the extra arm articulation can handle his light saber in a number of ways. I'm being considerate here, since the only real accessories are the lightsaber and the silly paper card. But if you include the transulcent removable cape, the removable mask and the fact that even his head is removable, you get quite a bit better score in the accessories department. Most of the new figures aren't worth the seven bucks they're charging. This one isn't quite worth it either, but it's pretty damn close. This figure is certainly a better value than most of the others in the current Collection 1 and Collection 2 sets. If you can find it at a retail store for around $6, you'll be even more pleased. When I first heard about this figure, I wasn't particularly excited. 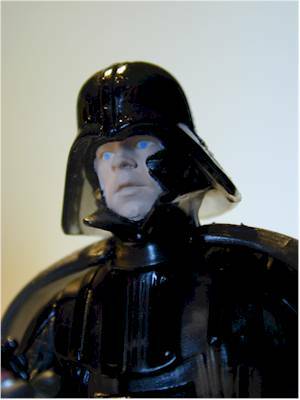 But now I've changed my tune, and can recommend this particular version of Vader to any Star Wars fan. 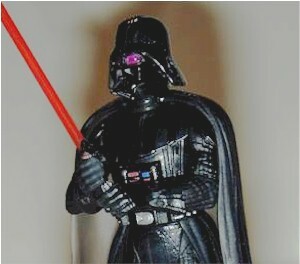 Thanks to James and Chris DeYonke for letting me photo their Vaders!